I am pleased to work with artists and artisans of many mediums, including candy. Cordon Bleu-trained Casey Hickey is a chocolatier and her husband is a wine guy -- together they are rocking a small but beautiful space in Myers Park's Tranquil Court shopping center. We are working on menus and packaging, but here is the rack card produced for their participation in Charlotte's recent Democratic National Convention. 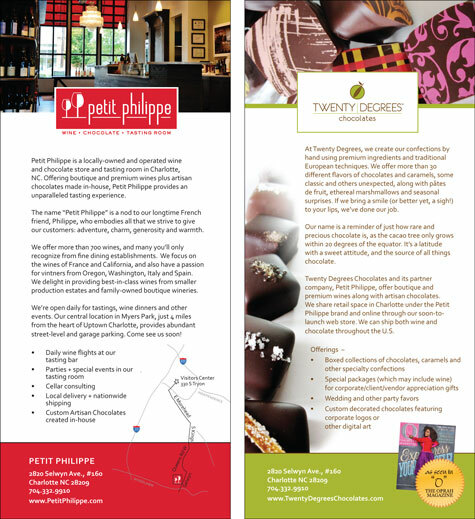 Just ordered these rack cards for client Petit Philippe and Twenty Degrees Chocolates. This husband-wife team runs a beautiful specialty wine and sweet shop in Myers Park and needed a card to share with visitors to their booth at next week's DNC CarolinaFest2012. Photography by the super-talented Tonya Russ Price of Poprock Photography.